If there's anything that's true in this life, it's that nothing is static. Things change. The good comes and goes along with the bad. No one is immune from this, but some people seem to be able to adapt to changes better than others. What makes these adaptable people more successful at riding the waves of change life throws our way? 1. They're accepting of change. This may seem simple or obvious, but it can be a difficult hurdle to jump. We can get comfortable and cozy in the way things are, and when change gets thrown our way, either forced upon us without choice or presented in the form of an opportunity, we shut down. We'd rather stay in the comfy, cozy place we've familiarized ourselves with than embrace the change full on. But that's what adaptable people do. They accept change as a part of life. You know how the first part of fixing a problem is recognizing it exists? The first part of adapting well to change is accepting that it exists, and will inevitably be a part of all of our lives. 2. They're aware and self-correct. Change sometimes comes at us like a wrecking ball. It's sudden, and there's no stopping it. But sometimes it's more stealthy, sneaking up on us slowly and without announcement until one day we wake up and don't know how we got into the situation we find ourselves in. Adaptable people are aware of these subtle changes, and adjust their behavior and decisions along the way to conform to the world that's morphing before them. Self-correction can be used for bigger changes, as well. When life changes, sometimes we have to be willing to adjust our goals and vision of the future. 3. They let go of the old to make way for the new. When we're adjusting our vision of the future, it can be difficult to let go of our previous plans and expectations. Even adaptable people go through a mourning process for broken dreams. But where they excel is letting go, even if it's difficult. They know that the process is difficult, but by releasing their old hopes and expectations they are making way for a future that has the potential to be even brighter and better. 4. They view pain as an opportunity for growth. There's a story about a group of arborists who tried to grow trees inside a greenhouse in order to protect them from the wind. The trees they grew were weak and not very tall. After studying, they concluded that the trees needed the wind to train them to be strong. They needed the resistance to enable them to grow to their full potential. Whether they know this analogy or not, adaptable people understand the principle behind this story. There is pain in life. There are troubles. There is turbulence. But without all these things, we could not grow to our fullest potential. We could not become everything we're capable of being. 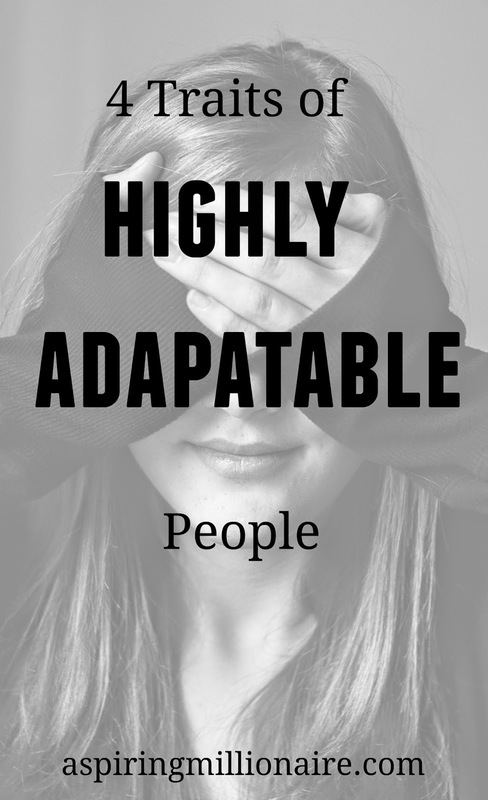 Adaptable people experience unpleasantness like the rest of us, but where others become mired down with misery, adaptable people ask, "What can I learn from what I've been through?" The next time you find yourself confronted by an unpleasant change, feel it. Don't deny it. Be aware of what's happening around you, and look for the opportunities for growth, and even better changes coming down the line.